Syrian women will be the pillars of any future democratic process. Their efforts deserve support from national and international actors. “I risked my life to participate in demonstrations against dictatorship and the oppression of Bashar Al-Assad. I’m not afraid of anyone, anymore. I’m a free woman.” (Syrian woman activist from Women Now’s network, 2012). In this quote you hear the voice of a capable and strong woman. Yet both in regime-controlled areas and in other regions of Syria, women’s rights have become instrumentalised by political forces seeking legitimacy in the eyes of the international community. From prior to the deterioration of the crisis until the present day, there have been commentators who have focused on the ‘Western’ and apparently ‘emancipated’ personality of Asma Al-Assad and other women associated with the regime, or the recent nomination of a woman to the head of the Syrian Parliament. Likewise, the women fighters of the Kurdish forces have also been the subject of significant attention by the Western media. Much of the media coverage of these women plays into longer-term romanticized and orientalist tropes. Meanwhile, the demands of thousands of Syrian women activists are being routinely ignored. How are we here and what is to be done? This is the first of a series of three articles from the ground which discuss some of the lessons learned in this context on strategies to reinforce women’s voices and participation during conflict. These articles address only the situation of women in areas outside the Syrian regime and under the control of opposition armed groups. The Assad regime has long instrumentalised women’s rights to legitimate its dictatorship in a way similar to other regimes in the region. The Assad regime’s discourse has major blind spots. For example, according to a report published by the UNFPA in November 2011, one in three women living in Syria has suffered domestic violence, with the prevalence of domestic violence in 2005 one of the highest in the world (with a percentage of 67%, Syria is second after Ethiopia 71%, and before Bangladesh 53%). These figures were gathered before the conflict in Syria and reflect phenomena hidden behind state propaganda pre-2011 which instead trumpeted the participation of elite women in the political sphere. Moreover, several Syrian laws contain discriminatory provisions against women, for example the penalty for honour killing is still softer than for other kinds of murder and no legislation specifically prohibits gender-based discrimination. Indeed, the discrimination of ISIS against women is rooted – at least in part – in the Syrian family code. Women Now For Development was established in 2012 with the initial objective of promoting women’s rights and activism in the context of what had initially been the peaceful uprising for dignity and social justice against the political violence, corruption and oppression of the Ba’ath regime. As the levels of horrific violence against peaceful activists worsened and the revolution itself became militarized, our mission adapted and evolved to address the new urgency to protect women’s status in society. The death and detention of many men across the country resulted in women newly becoming the heads of their households and the main breadwinners, which in turn presented both many challenges and also some opportunities. For the women that participate in Women Now For Development‘s activities, it makes no sense for the international community to focus on women’s rights and neglect the wider situation in terms of human rights. Indeed doing so has the consequence of undermining efforts to advocate for women’s rights. Support for women’s rights-focused interventions can only have limited impact in a context in which barrel bombs are falling on those same women, while their husbands and male children are being detained or forcibly recruited. And no one women under bombs or siege will speak up about sexual harassment to an international community who has failed to provide her the most basic protection and access to healthcare or aid. 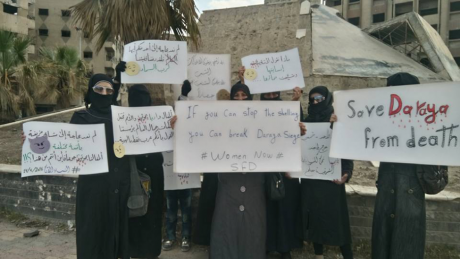 An international approach to women’s participation that really listened to women would help them through the protection of basic human rights and to support their demands, as should have happened during the Daraya campaign. By the end of March 2016, the siege of the city of Daraya was in its worse stage. Women in our network told us that they had not been able to eat in the past 48 hours, that their children were surviving by eating grass soup. Shocked, we shared this information in all our centres, presenting videos and organizing Skype calls with women in Daraya to understand what was happening there. A women’s group in the city wrote a letter to demand the end of the siege and the letter was diffused throughout all our centres. Women organized gatherings and wrote and signed in English and French, taking advantage of what they had learnt in our centres. They spend days and nights working to prepare the gatherings as documented in their diaries. Some of them wrote long letters which were sent to EU parliamentarians. Then on 1st June, the International Syria Support Group (ISSG) announced its intention to send aid. The women felt that for the first time, their voices had been heard. Unfortunately, two months later, the women of Daraya were forced to send another letter about the use of Napalm by the Syrian regime against their city. The letter remained unanswered as on the same day a decision was made to evacuate the civilian from the city opening the door to a new episode of Syrian tragedy: the forced displacement of population. In this unstable context, women’s networks give them a channel to articulate their demands and also sustain them. Women Now For Development started by supporting widows to set up their own income generating projects, including yoghurt factories and other small businesses. After a while, it became clear that women’s needs went beyond the purely economic: that women’s protection and participation in the public sphere needed to be addressed as part of a holistic approach. Based on this vision, and in collaboration with local female activists, we developed women’s community centres offering diverse services from psycho-social support, vocational training and education courses, to encouraging cultural, social and political participation. The centres also included libraries and nursing services for the women’s children, freeing the mothers to attend activities. By January 2014 Women Now For Development had established four women’s centres (one of them in Lebanon, the rest in Syria), and by 2015 this had expanded to eight centres reaching over 10,000 women and girls. Women Now’s ambition from the start was to link centres across Syria and Lebanon together as a national project to resist the de facto division of the country. A French course in Women Now centre in Idleb countryside (2016). Syrian women have shown incredible resilience and commitment to sustaining civilian activities, including the pursuit of peaceful livelihoods and education. Even as the bombs have rained down on the districts in which they live, women have continued to attend training to empower themselves. After one of the centres was relocated due to the horrific deterioration of attacks in that area, we were contacted by one young woman asking us to maintain its presence, explaining that it was her one lifeline to education and hope: ‘Please keep it open, it’s my only way to replace my university studies’. Another young woman in a northern area of Syria under daily Russian airstrikes shared with us her happiness at winning a book-reading contest – having read twenty books over the previous two months. The centres represent for the women who attend them a place of safety and comfort, and an alternative to the otherwise all-consuming nature of the conflict. It is this courage and creativity that have made possible the establishment of eight Women Now For Development centres. Towards the end of 2015, while a ceasefire was being negotiated in a besieged area, Women Now For Development reached out to several independent women activists within our network, to explore how we might support their advocacy and bring their demands to the attention of the media. There was only one main demand: the women called for a curriculum to be established for the local primary schools. This was despite the fact that they had been surviving without access to basic food or health facilities. They had lived for a period without essentials like sanitary towels and caesarean operations had been undertaken without anesthesia. Yet it was their children’s future education that they prioritized. Syrian women will be the pillars of any future democratic process in Syria. Women have been at the frontline of confronting violence, corruption and fundamentalism. They have organized against each of these at the community level and have issued statements with detailed recommendations on how to tackle them. Their efforts deserve support from national and international actors. This article is the first of a three part series on women activists in Syria by Maria Al Abdeh. Read the second.